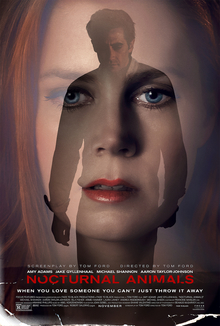 ‘Nocturnal Animals’ is fashion designer turned film director Tom Ford’s follow up to Colin Firth starring ‘A Single Man’, and it’s a beautifully crafted and evocative thriller. Starring Amy Adams as an art gallery owner, the film focuses on how she is affected by her ex-husband’s new novel, a violent thriller he sends to and dedicates to her. Structurally, the film moves between Susan (Amy Adams) as she reads the novel and is affected by events in her life, flashbacks to her relationship with Edward (Jake Gyllenhaal) and the telling of the novel written by Edward as Susan reads it. This film within a film approach is largely what makes the overall ‘film’ so engrossing and entertaining and in many respects it would work well as a film in its own right. What sets it apart is the smartly written and cleverly drawn parallels between the events in the novel and real life events, and ‘Nocturnal Animals’ is so skilfully put together that I was fully invested from the very beginning. Ford has amassed a very talented cast for the film and they all bring their A-game, with Michael Shannon and Aaron Taylor-Johnson the standouts from the supporting cast. Shannon is one of the best character actors in the business and he’s typically charismatic as a morally dubious detective in the ‘film within a film’, whilst Taylor-Johnson, an actor I’m generally indifferent too, is superb as one of the main villains. Amy Adams anchors the core of the film well, often a thankless task given many of her scenes are purely of her reading a book, but she excels every moment she’s on screen. Jake Gyllenhaal perhaps has the meatier part, getting to play two different characters, and it’s another excellent performance to add to a resume that has been very impressive over the past few years. Ford directed Colin Firth to his first Oscar nomination in ‘A Single Man’ and don’t be surprised if some recognition comes the way of many of his cast members for this stellar ensemble display. Visually the film is an absolute treat, from the sterile environment of Susan’s big house which only serves to heighten her isolation from the people around her (including her disinterested husband), to the desolate highways of the ‘Nocturnal Animals’ novel that are reminiscent of some of David Lynch’s work, including the excellent ‘Lost Highway’ of course. ‘Lost Highway’ feels like a clear touchpoint here, with a violent and disturbing narrative in a similar setting, although ‘Nocturnal Animals’ is more straightforward and grounded than Lynch’s more surreal works. Ford has a perfect grasp on his material here and his control of tone and pacing in particular allows ‘Nocturnal Animals’ to develop its narrative in a confident and composed manner. When the parallels start to become more apparent between Edward’s book and real life events it’s genuinely thrilling and I was excited to follow how the narrative pans out straight through to the excellent and perfectly weighted conclusion. ‘Nocturnal Animals’ is an excellent and intelligent psychological thriller, with arresting visuals and magnetic performances from an outstanding cast, and it’s one of the best films I’ve seen of late.